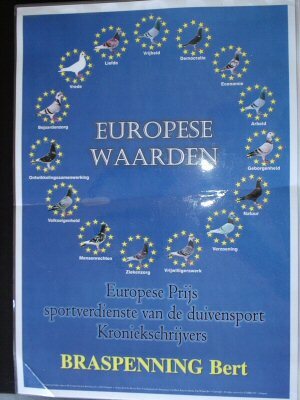 In Europe a neutral commission of 7 experts, has a number of important cases about fixing of the pigeon sport. The commission established an inquiry where 2000 people voted on various issues. There goal was the come to a protected list of breeders of race pigeons, breeders of long distance racers, breeding studs, chronicle writers and a several other important areas of the pigeons sport. -they must have minimal 50 years race pigeons, -they must have made topresults at the races and the shows, -other fanciers must have made good results with the breeders birds. -The breeder must all know about breeding a own collection and -he must know the LAW OF MENDEL. Every fancier in Europe who can do on this condition was controlled by the team of 7 researchers. After that there was one year that everybody could make comments about these fanciers. After this year the names were registered by the E.E.C. This certificate implicates that the breeder/fancier who has such a certificate may call his birds are of an own strain. 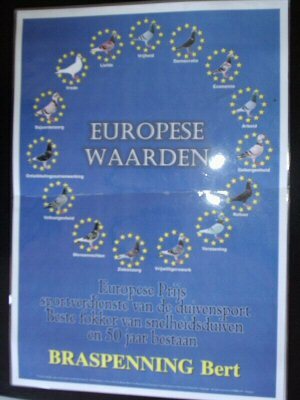 So Bert can call his birds officially Braspenning birds and the strain Braspenning. When ever there is an illness amongs the pigeons and pigeons need te be killed, the fanciers with a certificate do not have to kill the birds. They are protected by the E.E.C. conditions of the regulations have received a certificate from the researcher Gerard de Cuyper(Belgium). All that received certificates are officially registered and a book is being composed with the names of those that received the certificates. Such people as Jos van Limpt (de Klak) and Albert Marcelis received these certificates but unfortunately both died in the first period of 2004.